The Rotonde de Cartier Earth and Moon watch is the fruit of a technical and creative ambition that for Cartier consists of bringing together two complications in a daring display. Removed from its strictly horological role, in which it serves as a guarantee of precision and prestige, a tourbillon has been incorporated into a moon phase complication, with each one dependent on the other. 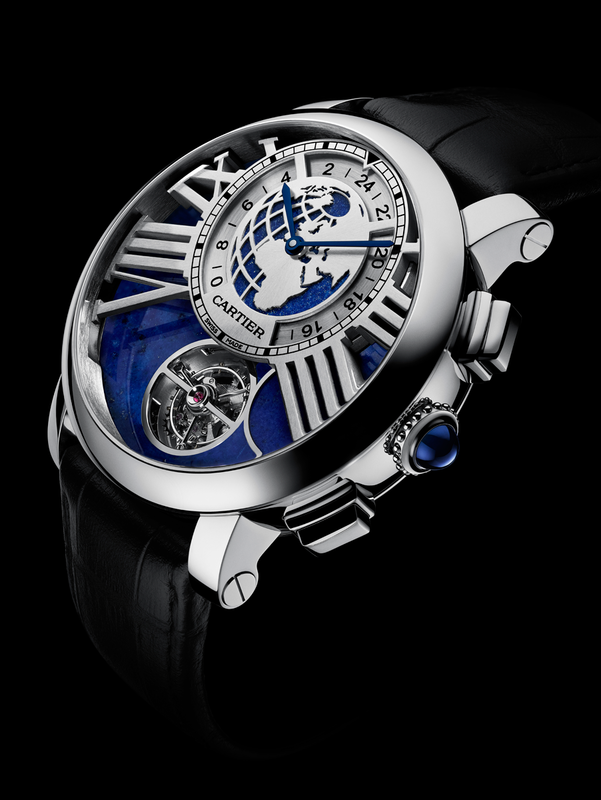 The watch owes its name to the stylised portrayal of the globe and the moon represented by a tourbillon. Together, they form a creative and animated world with skeletonised Roman numerals surrounding this dynamic feat of watchmaking. The moon-phase mechanism of the Rotonde de Cartier Earth and Moon watch is founded on a creative and complex design that combines a tourbillon, moon phase on demand and a second time zone. The Tourbillon mechanism is a complex complication that falls within the expertise of a limited number of watchmakers. Its main function is to fight against the effects of gravity when the watch is in a vertical position. Because it appears in its original form and exists only when its user wishes it to, the moon phase on the Rotonde de Cartier Earth and Moon watch reveals a technical creativity that is doubly innovative. By pressing the push-button situated at four o’clock on the side of the case, a panels descends and partially obscures the Tourbillon carriage. The crescent thus formed reproduces exactly the moon’s shape in the sky. a 24-hour disc that was entirely redeveloped by for the calibre 9440 MC due to the sophistication of its disc display. 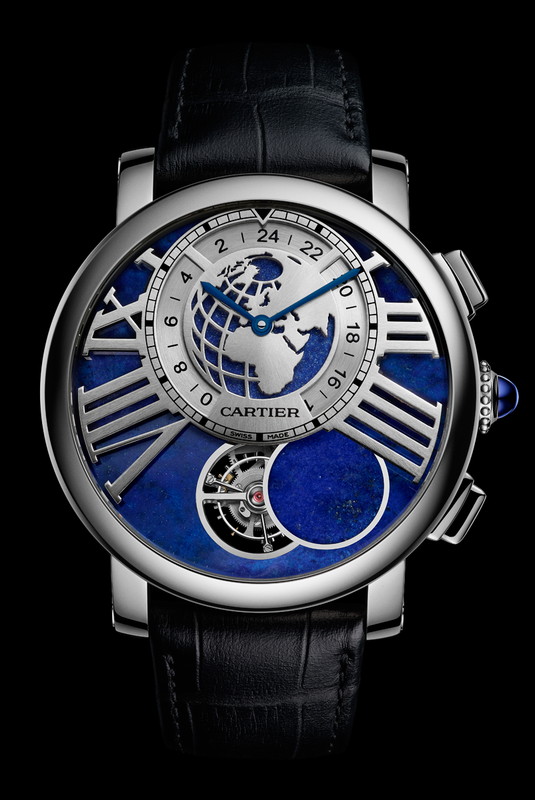 The result of painstaking work, polished lapis lazuli is used for the dial and the moon panel on the Rotonde de Cartier Earth and Moon watch. The hours and the second time zone are surrounded by a meticulously polished grid in 18-carat white gold. A three-dimensional dial is one of the signature features of the Cartier Fine Watchmaking collection, alongside Roman numerals that are openworked and chamfered by the hand of a master decorator in a manner akin to a skeleton movement. The exceptional finishes of the 9440 MC are all the more remarkable because the semi-skeletonised bridges on the back of the movement are structured in a star shape, echoing this precious timepiece’s lunar and terrestrial character on the case back. With the the Rotonde de Cartier Earth and Moon watch, the Maison Cartier has created a timepiece that displays an exceptional level of creativity and craftsmanship. 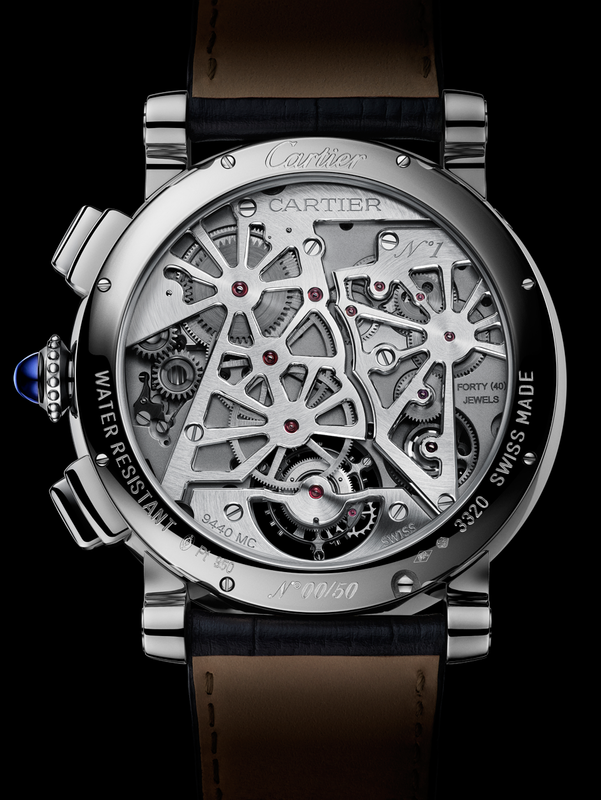 The back of the Rotonde de Cartier Earth and Moon watch showing the star shaped semi-skeletonised bridges on the 9440 MC movement. Limited series of 50 numbered pieces.